Taking your pet abroad has become much easier since new Pet Travel Scheme rules came into force on 1st January 2012. This microchip gives your pet unique identification. It is inserted under the skin and detected by an electronic scanner. It must be in place before the rabies vaccination. This injection can be given on the same day as the identichip, as long as the chip is given first. The chip number will be recorded on our computer, in your vaccination card and on the pet passport. It is important to check the criteria of the country that you plan to travel to, in case the vaccinations need to be given more frequently than for the purpose of the passport. Normally one rabies vaccine is sufficient to provide protection but in some instances, two injections are recommended 2-4 weeks apart. One of our Veterinary Surgeons will be able to advise you on this. Having completed these two steps, your pet can then be issued with a Pet Passport. 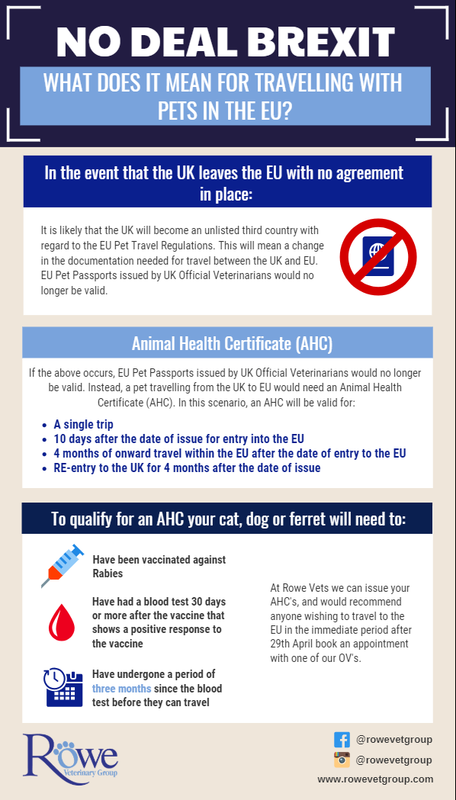 Animals will be allowed to re-enter the UK using a Pet Passport 21 days after the rabies vaccination. In addition, your pet will need to have treatment against tapeworm before travelling back to the UK. The treatment must be administered by a vet not less than 24 hours and not more than 120 hours (1-5 days) before its scheduled arrival time in the UK. There is no longer a mandatory requirement for tick treatment before entering the UK, although we strongly recommend that your pet is treated, as ticks present in mainland Europe can carry potentially life-threatening diseases. We also recommend protecting your pet against sand flies, Heartworm, Babesiosis, Leishmaniasis and Ehrlichiosis. We can give advice on all of these diseases and how to protect against them. If you are travelling to a country outside the EU, you will need to contact Defra to find out about any requirements for entry into the destination country as these will vary. We will then be more than happy to arrange for an appointment for you and your pet to see one of our Veterinary Surgeons to fulfil the requirements for travel. It is good practice to have your identichip checked whenever you are at the Veterinary Practice. Not only does this give you the confidence to know that if your pet was ever lost or involved in an accident then the finder can trace you, it also means that, when you are travelling abroad, the scanners at the ports will always be able to find the chip in your pet easily. Full details of the Pet Travel Scheme can be found on the Defra Website.